Hola, friends! Yesterday was a crazy delish day of eats so I’m super pumped to share with you and hopefully inspire you to get down and dirty in the kitchen. 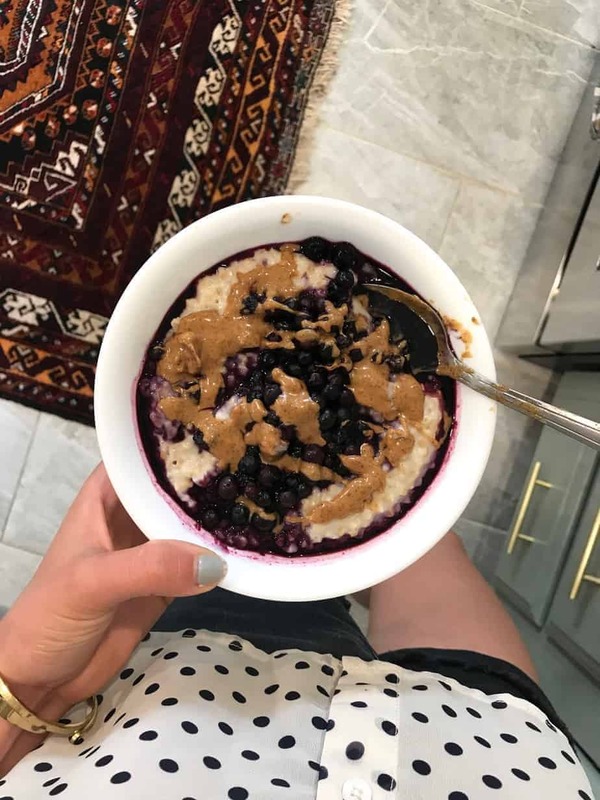 Breakfast was Overnight Steel Cut Oatmeal with warmed frozen wild blueberries and almond butter. I’ve been craving oatmeal every day and it’s so nice to not have to actually cook it in the morning! If you have any leftover cooked oatmeal, my cozy Pumpkin Oatmeal Muffins are a great way to use it up. Delish with a cup of joe. Random PSA: the Instant Pot is currently $20 off in case you’ve been on the fence about getting one. I just bought it in anticipation of my friend Megan’s newest Instant Pot cookbook that comes out in October (you can pre-order now) and I can’t wait to play around with it! Any Instant Pot fans out there?! Lunch was a Tuna Kraut sammie at Alchemy plus tomato bisque made with basil and cashew cream. 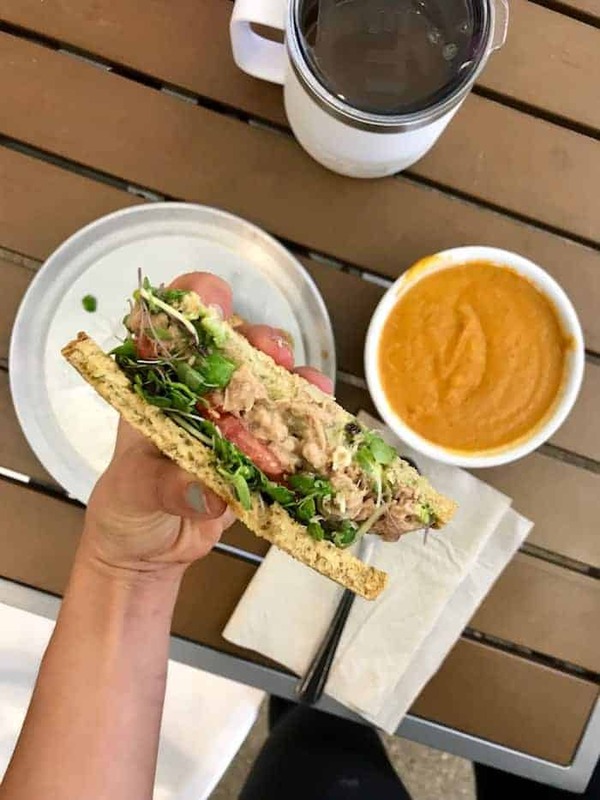 For the tuna salad, we use an amazing organic sauerkraut plus chopped apple, olive oil, dijon, and red wine vinegar rather than mayo and it’s perfection paired with avocado, tomato and local micro greens. Spotted: my favorite white Yeti coffee mug! 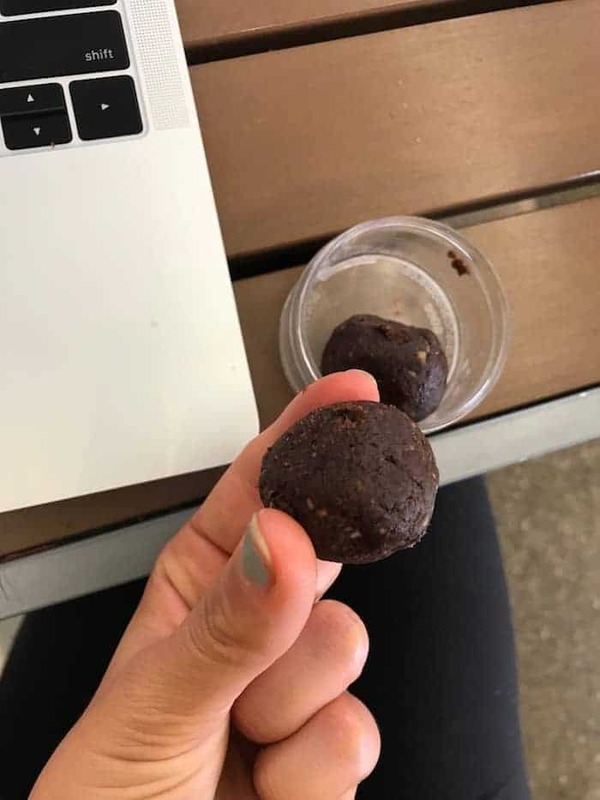 Snackage included two of these no-bake brownie bites. I added a scoop of chocolate protein and they were extra good! Dinner! I basically smushed together my lasagna recipe with my Fall Vegetable Baked Spaghetti by doing the proportions of the lasagna to fill a 9×13 pan and adding 1/2 cup pumpkin plus 1 tsp sage to the tofu ricotta. For the veggie layer, I did local Brussels sprouts, mushrooms, zucchini, and a bunch of greens. I used these lentil lasagna noodles and two jars of this awesome heirloom tomato sauce I found at Kroger plus leftover marinara from Costco because I love me some saucy lasagna. It was huge and incredible and fed us for three nights, which is unheard of. I always make something big like this on Sunday so I don’t have to cook Monday (and ideally Tuesday). I made a really yummy salad to go with the lasagna with greens from our CSA, truffled goat cheese, acorn squash roasted with pumpkin pie spice, and toasted walnuts. For the dressing, I whisked together extra virgin olive oil, apple cider vinegar, dijon, maple syrup, salt, and pepper. It was INCREDIBLE. For something crunchy, I broiled Trader Joe’s sourdough with butter, salt, garlic, and nooch. Homemade garlic bread on point! Dessert was the most magical pumpkin pie bars with pecan cookie crust coming to the blog TOMORROW! You’re gonna freak for this recipe so don’t miss it. I ate one right off the photography board! 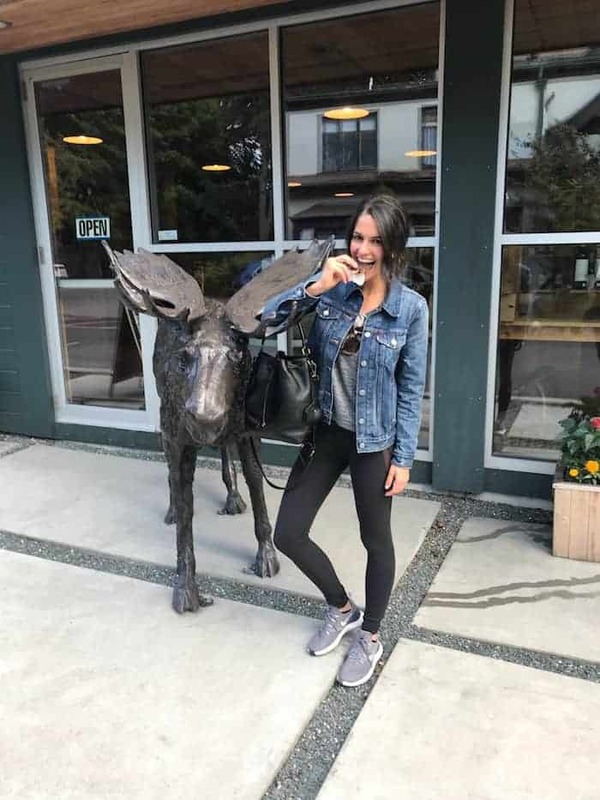 Throwback comfy walking outfit from Maine! Gray tee (similar), the comfiest high-waisted mesh leggings, Levi’s jean jacket, polarized sunnies, and gray Nike’s. A little going out outfit before dinner with friends. 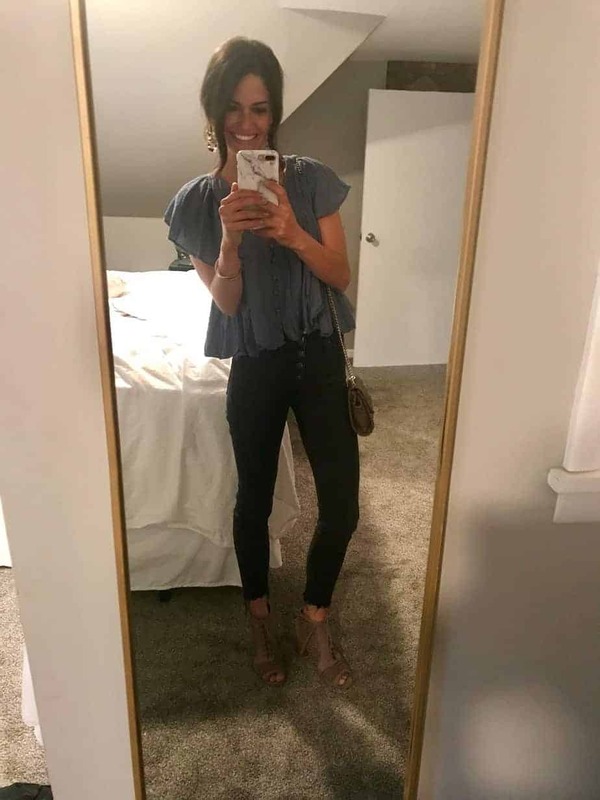 My go-to black jeans, an older blue top from Zara, sandals, and similar tortoise earrings, similar brown mini crossbody bag (I have this bag and black and white!). Who’s excited for fall clothes?! I ordered this sweater, this ruffle dress, this cream cardigan (on sale), and these platform slip ons for casual days and travel. I’ll post pictures once I have them! Have the best week, friends. Love the fashion portion of this post each week!! So glad you throw it in there you’ve got great style. Also can’t wait for those bars!!! ? OMG YUM! I already know I’m gonna LOVE those bars because your pumpkin almond butter bars are my favorite thing ever. 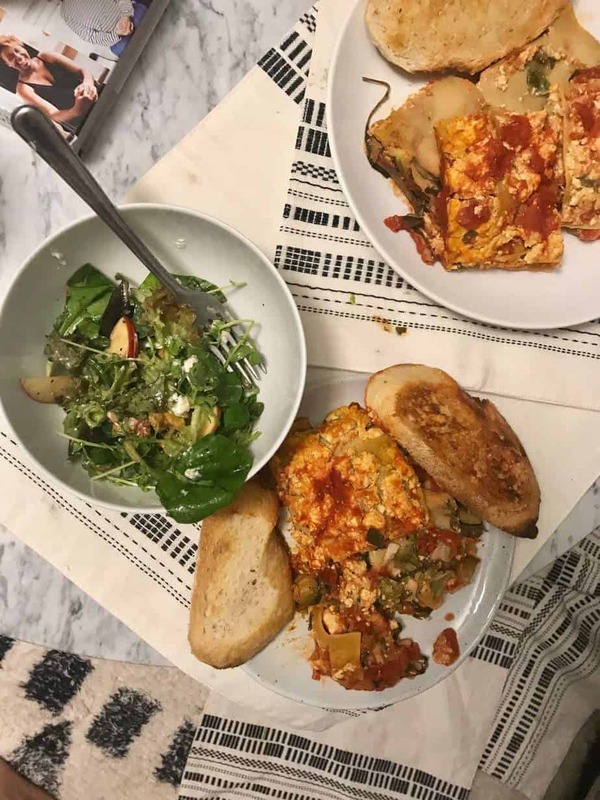 That lasagna dinner (and salad) both sound DREAMY. I immediately printed your pumpkin muffin recipe, and I cannot wait to make them this weekend! I’ll whip up a batch of steel cut oatmeal and have both hot oatmeal and muffins waiting on us to enjoy throughout the week. :) I cannot wait for the pumpkin bar recipe too! All of you meals look amazing, most especially your lasagna. Perfection! Also, your fashion is fire as always. <3 Have a beautiful day! Give me all the pumpkin things! So excited for the recipe! I am more than ready for fall clothes! I need to try those lentil lasagna noodles!!! Love how many veggies you add to your lasagna. I love making a big batch of something early in the week too for leftovers! 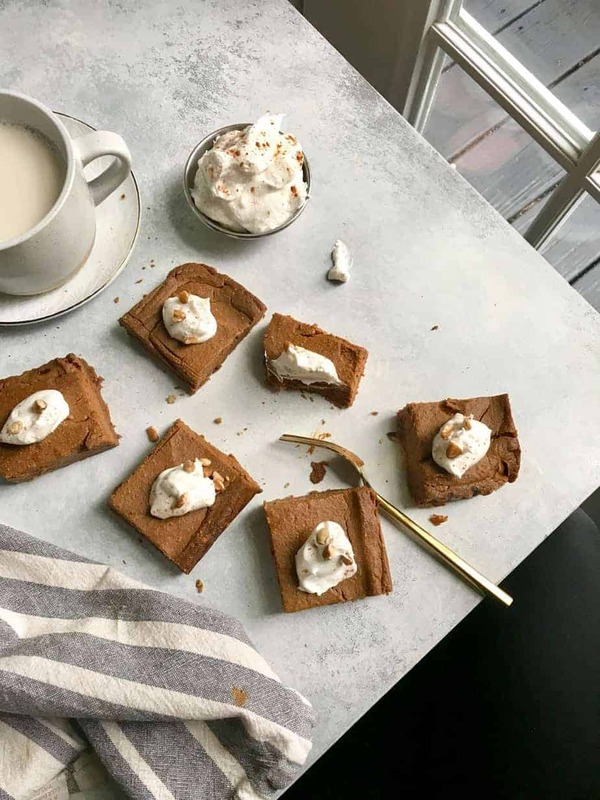 And super excited about those pumpkin bars tomorrow…pecan crust sounds delicious!